For the fifth year in a row, the Congressional Progressive Caucus solicited the assistance of the Economic Policy Institute Policy Center (EPIPC) in analyzing and scoring the specific policy proposals in its alternative budget and in modeling its cumulative impact on the federal budget over the next decade. The policies in CPC’s fiscal year 2016 budget—The People’s Budget: A Raise for America—reflect the decisions of the CPC leadership and staff, not those of EPIPC (although many of the policies included in the budget overlap with policies included in previous EPI budget plans). Upon CPC’s request, the nonpartisan Citizens for Tax Justice (CTJ) independently scored the major individual income tax reforms proposed in the People’s Budget. All other policy proposals have been independently analyzed and scored by EPIPC based on a variety of other sources, notably data from the Congressional Budget Office (CBO), the Joint Committee on Taxation (JCT), the Office of Management and Budget (OMB), and the Tax Policy Center (TPC). Thomas Hungerford, the author of this year’s analysis, would like to acknowledge former EPI Policy Center staff members Joshua Smith, Andrew Fieldhouse, and Rebecca Thiess, whose analyses of previous CPC budgets served as the template for this report. The primary objective of the People’s Budget is consistent with the Congressional Progressive Caucus’s FY2015 budget alternative: Use expansionary fiscal policy to directly address the nation’s most pressing economic challenges and target a rapid and durable return to full employment. The budget was developed from the evidence-based conclusion that the present economic challenge of joblessness results from a large demand shortfall—the result of the Great Recession and its aftermath—and that the depressed state of economic activity is largely responsible for increased budget deficits and the recent rise in public debt. Further, much recent research indicates that aggregate demand is likely to remain depressed in coming years without a fiscal boost (this hypothesis about chronic ongoing demand shortages is often referred to as “secular stagnation”). High unemployment in turn is exacerbating the decade-long trend of falling working-age household income and the three-decades-long trend of markedly increasing income inequality. Moreover, since mid-2010, contractionary fiscal policy has greatly contributed to the continuing slack in the labor market and stagnant earnings for most workers. The slack in the labor market can be seen in the elevated unemployment rate, low labor force participation rate, high labor underutilization rate, and the high proportion of long-term unemployed workers. Expansionary fiscal policy can help ensure a prompt and durable return to a full-employment economy with rising wages. Accelerating and sustaining economic growth, promoting economic opportunity, and pushing back against the sharp rise in income inequality remain the most pressing economic challenges confronting policymakers. To directly address these issues, the People’s Budget invests heavily in front-loaded job creation measures aimed not only at putting people back to work, but also at addressing the deficit in physical infrastructure and human capital investments. In stark contrast to the current austerity trajectory for fiscal policy—notably the expiration of emergency unemployment insurance, cuts to the Supplemental Nutrition Assistance Program (food stamps), and the continuation of discretionary spending caps and sequestration spending cuts—the People’s Budget substantially increases near-term budget deficits to finance targeted stimulus, including infrastructure investment, aid to state and local governments, targeted tax credits, and public works programs. These types of investments would yield enormous returns—particularly by reducing long-run economic scarring resulting from underutilization of productive resources—and raise national income and living standards. Beyond improving middle-class living standards, using expansionary fiscal policy to ensure a rapid return to full employment is fiscally responsible. A significant portion of the sticker price of fiscal stimulus will be recouped through higher tax collections and lower spending on automatic stabilizers, such as unemployment insurance. Higher levels of economic activity will also decrease near-term budget deficits and public debt as a share of GDP. While future budget deficits may decrease future living standards, the much more immediate problems of high joblessness and depressed levels of economic activity are decreasing both present and future living standards. Ensuring a rapid return to full employment hedges against many downside fiscal risks, notably slower-than-projected economic recovery, larger-than-projected cyclical budget deficits, and decreased long-run potential GDP due to economic scarring. The People’s Budget would further promote fiscal responsibility and a sustainable public debt trajectory by raising revenues progressively, exploiting health care efficiency savings, and maintaining the reduced spending trajectory of the Department of Defense (DOD). After increasing near-term borrowing to restore full employment, the budget gradually reduces the debt ratio to a fully sustainable 66.0 percent of GDP by FY2025. 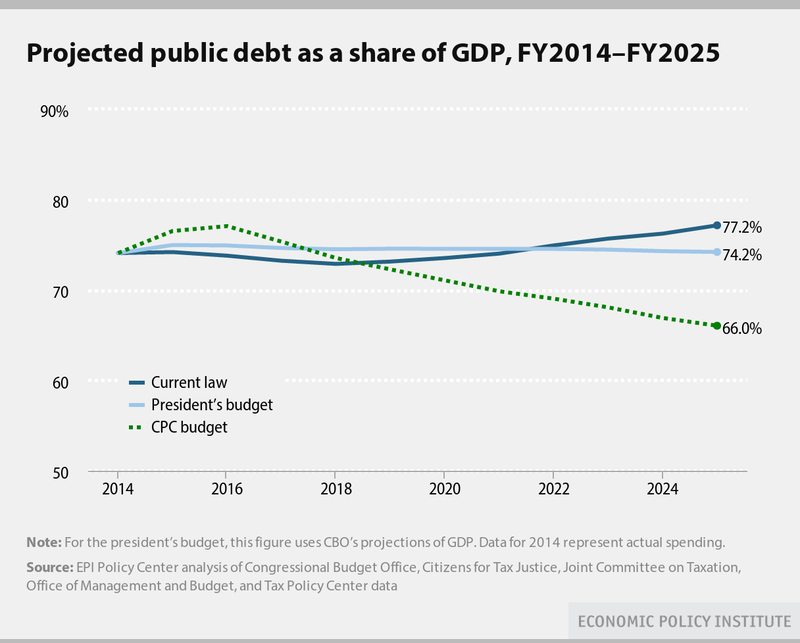 Relative to current law, the budget would reduce public debt by $3.2 trillion (11.6 percent of GDP). The most pressing objective for macroeconomic policy, particularly fiscal policy, is rapidly restoring the economy to full health and ensuring that this return is sustainable. More than seven years have passed since the onset of the Great Recession in December 2007, but growth in the 5.5 years since the recession’s official end has been too sluggish to restore the economy to prerecession conditions, let alone to restore genuinely full employment. Unemployment as of February 2015 stands at 5.5 percent, the lowest rate seen since 2008 but still 1 percentage point higher than the annual rate in 2007, when the recession hit, and higher than any rate since 2004. Further, the unemployment rate likely understates how sluggish labor market recovery has been. The share of adults age 25–54 with a job—which fell an unprecedented 5.5 percentage points (from 80.3 percent to 74.8 percent) from its peak to trough due to the Great Recession—is now still just at 77.3 percent, and is still not even halfway recovered. As of February 2015, the “jobs gap”—the number of jobs needed to restore the labor market to prerecession health—stood at a staggering 5.5 million jobs (Economic Policy Institute 2015a).5 Moreover, there was only one job opening for every two job seekers (Gould 2015). The jobs gap is especially acute—and repairable—in the public sector. There are 656,000 fewer public-sector jobs now than when the recovery began in June 2009; if the number of such jobs had merely kept up with population growth, there would be 1 million more than in June 2009. Therefore, altogether there is a public-sector jobs gap of nearly 1.7 million jobs (Economic Policy Institute 2015b). The economic slack is a continuing consequence of the bursting of the housing bubble, which erased trillions of dollars of wealth from household balance sheets. The effects rippled through the economy as consumers pulled back their spending, construction spending cratered, businesses stopped investing and expanding, financial intermediation broke down, and state and local governments cut spending as tax receipts fell. In short, households, businesses, and governments stopped spending enough to keep their workers and resources employed. The resulting shortfall in aggregate demand has not—even seven years after the fact—ever been fully filled in. The pace of economic growth since the economy emerged from recession in July 2009 has been too sluggish to restore the economy to full health, almost entirely because fiscal policy since the recovery began has been historically contractionary. While fiscal policy during the recession—particularly the American Recovery and Reinvestment Act (ARRA)—was strongly expansionary and arrested the economy’s sharp decline, economic performance has since fallen somewhat, largely because fiscal policy became increasingly contractionary. This turn toward fiscal contraction has been largely driven by the enactment of the Budget Control Act (BCA) of 2011, which cut and capped discretionary spending and established the automatic “sequestration” spending cuts that took effect March 1, 2013. Discretionary spending cuts aside from the BCA—January 2013’s expiration of the payroll tax cut, December 2013’s expiration of federal emergency unemployment benefits, and two rounds of benefit cuts in the Supplemental Nutrition Assistance Program—have also intensified fiscal drags. Regrettably, the budget deal passed by the lame-duck Congress in January 2013 (the American Taxpayer Relief Act, or ATRA) failed to address the fundamental challenge posed by the “fiscal cliff” of legislated spending cuts and tax increases and instead accelerated the pace of deficit reduction relative to then-current policy (Fieldhouse 2013a). The Bipartisan Budget Act of 2013, signed into law in December, unwound some of the defense and nondefense discretionary sequester cuts over FY2014–2015, but at $63 billion over two years, did not boost aggregate demand sufficiently to ensure a full recovery, let alone drive the economy to genuine full employment. The sheer size of the contraction of government spending since the end of the Great Recession is unprecedented. If public spending in the current recovery simply matched the growth trajectory of that of the early 1980s recession and recovery, spending would be $800 billion higher now. When multiplier effects are taken into account, this level of spending would have induced a full recovery by now (Bivens 2014). By prematurely pulling away from fiscal support, policymakers condemned the economy to years of unnecessarily depressed output, anemic growth, high unemployment rates, and large cyclical budget deficits (Bivens, Fieldhouse, and Shierholz 2013). Instead of prioritizing recovery, the Washington budget debate remains too focused on the one policy intrinsically at odds with spurring near-term economic growth—reducing budget deficits. However, deficits will remain high as long as the economy is depressed. While the pace of job growth picked up substantially in 2014, slack remains in the U.S. labor market, and this slack must be worked off before full employment is reached. The clearest sign of this continuing slack is the absence of acceleration in nominal wage growth over the recovery. Given that the economy is still underperforming, the benefits of aggressive fiscal policy to restore the economy to full employment and hold it there for a considerable length of time could be large. Ball, DeLong, and Summers (2014) and Bivens (2014) have shown that the damage done to estimated long-run potential GDP by the extended period of economic underperformance could likely be reversed by an extended period of full employment. Using fiscal policy to boost aggregate demand is not only the key to achieving a durable return to full employment, it will also actually prove largely self-financing in dollar terms and improve key metrics of fiscal health (notably the public-debt-to-GDP ratio) in the near term, as long as interest rates remain historically low. Conversely, budget austerity—particularly cutting spending—is so economically damaging that it actually becomes fiscally counterproductive in current conditions, with recent spending cuts actually projected to increase the debt-to-GDP ratio (Fieldhouse 2013b). While policymakers’ misplaced obsession with reducing the federal debt and deficits seems to have abated somewhat in light of December 2013’s Bipartisan Budget Act (the deal made by House Budget Committee Chair Paul Ryan and Senate Budget Committee Chair Patty Murray) and a congressional détente over the debt ceiling, Congress remains far from embracing expansionary fiscal policies that would reliably lead to a durable return to full employment. The People’s Budget takes a strong stand for such policies by unequivocally affirming the goal of closing the jobs gap and returning the economy to full employment, all while ensuring sustainable projected deficit and debt levels. The People’s Budget makes targeted investments in job creation and infrastructure spending aimed at rapidly restoring full employment and supporting sustained recovery, while also making targeted cuts to reflect national priorities and improve efficiency in the budget. Although outlays would rise to 23.7 percent of GDP in FY2016 as the budget pursues expansionary fiscal policy, outlays would fall and average 22.9 percent of GDP over the last five years of the budget window (FY2021–2025), only 1.7 percentage points higher than the average under current law (see Summary Tables 2 and 4). The People’s Budget ramps up spending in the near term in order to support economic recovery and pursue full employment. Investments over the 10-year window are thus frontloaded to address current economic needs; 63 percent of total job creation measures within the 11-year FY2015–2025 window are allocated over FY2015–2018, corresponding with the calendar years 2015–2017, when the People’s Budget most heavily invests in stimulus measures and when economic support is most needed (see Table 2).6 In later years, increased spending largely consists of additional infrastructure spending to help meet estimated needs, as well as sustained increases in nondefense discretionary (NDD) spending to keep it roughly in line with historical averages instead of letting it fall to a 60-year low of 2.3 percent in FY2025, as is currently projected under current law (see Figure C). To ensure federal civilian and veteran retirees are not experiencing a decline in their purchasing power, the People’s Budget indexes their retirement benefits to the Bureau of Labor Statistics’ experimental consumer price index for elderly households, or CPI-E, which more accurately reflects the buying patterns of American senior citizens. The change will result in additional outlays of $18 billion over FY2016–2025 (see Table 1). As shown in Table 2, the People’s Budget also funds a number of job creation tax measures. It introduces the Work Hard Tax Credit, an expanded version of the now-expired Making Work Pay tax credit, for calendar years 2015–2016. In its first year, the Hard Work Tax Credit will be 150 percent of the old Making Work Pay credit, and is scaled back in the second calendar year.9 The budget also expands the earned income tax credit to greatly increase the credit’s generosity to childless workers, thus increasing the program’s work incentive for this group. The $61 billion expansion was highlighted in President Obama’s FY2016 budget (OMB 2015). Moreover, the People’s Budget finances $126 billion in tax credits for businesses over FY2016–2025, including continuation of the research and experimentation credit as well as green manufacturing incentives. In addition to these targeted job creation measures, infrastructure investments, and tax credits, the People’s Budget invests heavily in the nondefense discretionary (NDD) budget, which houses a range of critical public investments in areas such as education, energy, basic scientific research, workforce training, and health. The Budget Control Act (BCA) enacted deep cuts to the NDD budget; repealing these cuts starting in FY2016 will result in an additional $342 billion over FY2016–2025 in needed NDD investments, and the People’s Budget would repeal these cuts, along with the entirety of the discretionary and mandatory BCA spending caps and sequester cuts.10 Beyond this repeal, the budget would finance a $1.6 trillion increase in NDD budget authority over FY2015–2025 (this translates to a nearly $1.9 trillion increase in NDD outlays over current law).11 Sustaining these investments is critical for building the country’s stock of public and human capital, a key driver of long-run productivity growth (Bivens 2012a). This increase in NDD spending covers a 4 percent raise in 2015 for federal civilian employees. Investments and job creation measures in the budget total $1.6 trillion over FY2015–2018 (see Table 2), which, when combined with the other spending and revenue provisions within the People’s Budget, is in line with the level of fiscal support needed to fully close the remaining jobs gap. These NDD investments bring total job creation and public investments in the People’s Budget to $3.5 trillion above the current law baseline over FY2015–2025 (see Table 2).12 Critically, NDD budget authority would average 3.4 percent of GDP over FY2015–2025, as opposed to averages of 2.6 percent under current law or under the president’s FY2016 budget request.13 By FY2025, NDD budget authority under the People’s Budget is projected to be 3.1 percent of GDP, compared with 2.3 percent under current law and 2.4 percent under the president’s budget (see Figure C). This classification of federal spending is especially vital because much of it is needed public investment—purchases the government can make now that will boost employment in the short run but provide lasting benefits, such as infrastructure and education. Under current law, such investment will soon reach its historical low as a share of GDP and continue to decline thereafter (Smith 2014a). The People’s Budget also proposes realigning the pace of defense savings and finding other targeted and efficient savings in the budget. Over FY2016–2025, the CBO 2015 current law baseline includes a $134 billion reduction in DOD outlays from the BCA spending caps and sequestration cuts. The People’s Budget repeals these cuts and replaces them with similarly sized cuts. The budget provides $92 billion in budget authority for overseas contingency operations (OCO) for FY2015—enough to fund full and safe withdrawal from Afghanistan—after which all OCO funding is ended. Responsibly reducing OCO spending would save $761 billion over FY2016–2025 relative to current law (see Table 1). The People’s Budget achieves savings outside of the Defense Department as well, many of which would build on the efficiency reforms already enacted in the Affordable Care Act. The budget implements the following policies: the addition of a public insurance option to Affordable Care Act health insurance exchanges, negotiation of Medicare Part D pharmaceutical drug prices with pharmaceutical companies (similar to current negotiation of drug prices through Medicaid), reform of pharmaceutical drug development and patent rules, payment and administrative cost reforms, and efforts to reduce fraud and abuse in Medicaid. In total, implementing these policies would decrease budget deficits by an estimated $432 billion over FY2015–2025 (see Table 1). This would much more than offset the $135 billion FY2015–2025 cost of permanently eliminating the Medicare Sustainable Growth Rate formula (otherwise known as implementing the “doc fix”), the scheduled cuts in Medicare providers’ pay that Congress has routinely papered over on a temporary basis since 2003, and the $88 billion revenue loss from repealing the excise tax on high-premium health insurance plans. Along with health savings, the People’s Budget would adopt a proposal in the president’s FY2016 budget to cut $16 billion from crop insurance subsidies—a proposal made necessary by the expansion of the subsidy program in the Agriculture Act of 2014. The U.S. tax code is failing in a number of dimensions. Tax receipts have been deliberately driven down to levels that cannot support current national priorities (let alone commitments to an aging population), tax policy has increasingly exacerbated income inequality, and complexity within the tax code means that an individual’s or corporation’s tax bill can too easily depend on the abilities of one’s accountant. The People’s Budget would reform the tax code by enacting policies that would restore lost progressivity (so that effective tax rates rise with income), push back against rising income inequality, raise sufficient revenue, and close inefficient or economically harmful loopholes. Although tax increases are contractionary in current conditions, the economic impact of a dollar of government spending (as shown by the fiscal multiplier) is about four to seven times higher than the economic impact of a dollar of revenue (Bivens and Fieldhouse 2012). Since much of the revenue would be raised from upper-income households and businesses (which have relatively low marginal propensities to consume and thus particularly low fiscal multipliers even among tax changes) and used to finance high bang-per-buck job creation measures, the relatively small fiscal drag from raising revenue would be more than mitigated by the other budget policies. The People’s Budget increases revenues as a share of GDP by over 3 percentage points over FY2016–2025, from 18.4 percent under current law to 21.5 percent. Though higher relative to GDP than the previous postwar high point of 19.9 percent in 2000 (OMB n.d.), this percentage remains small relative to that of other developed economies. Moreover, aside from the United States, the great majority of advanced economies have increased their revenue-to-GDP ratios in recent decades (OECD n.d.), a logical extension of greater national wealth and aging populations. The People’s Budget raises individual income tax revenue relative to current law by enacting what was referred to as “Obama policy” prior to enactment of the ATRA; that is, it allows Bush-era tax rates to expire for tax filers with adjusted gross income (AGI) above $200,000 ($250,000 for joint filers).14 Though tax rates were scheduled to revert to Clinton-era levels at midnight on December 31, 2012, the ATRA extended the income tax cuts for those with AGI under $400,000 ($450,000 for married couples), making permanent the reduction in the 25, 28, and 33 percent brackets and creating a new 35 percent bracket for taxable income up to a $400,000 threshold.15 Under the People’s Budget the 33 percent bracket would revert to 36 percent and the 35 percent bracket would revert to 39.6 percent. The AGI threshold at which the personal exemption phase-out and limitation on itemized deductions are triggered would be lowered from $300,000 ($350,000 for joint filers) to $200,000 ($250,000 for joint filers). The People’s Budget would also permanently extend the ARRA expansion of refundable tax credits—the earned income tax credit, the child tax credit, and the tuition tax credit—beyond their scheduled expiration on December 31, 2017, at a cost of $166 billion over FY2018–2025. As Table 1 shows, the People’s Budget makes a number of additional policy changes to the individual income tax code. The budget repeals the step-up basis for capital gains at death ($352 billion in new revenue over FY2016–2025); increases progressivity in the tax code by capping the value of itemized deductions at 28 percent ($566 billion); denies the home mortgage interest deduction for yachts and vacation homes ($14 billion); and ends the exclusion of foreign earned income ($77 billion). The budget subjects S corporations to the self-employment tax ($75 billion in revenue over FY2016–2025). Finally, the People’s Budget would enact comprehensive immigration reform that includes a path to citizenship, resulting in more taxpayers paying income and payroll taxes, and it would qualify these residents for refundable tax credits (on net saving $237 billion over FY2015–2025). On the corporate side, the People’s Budget eliminates some of the most egregious loopholes and enacts other progressive reforms. The budget repeals voluntary deferral of taxes owed on U.S.-controlled foreign companies’ source income, ends the Subpart F active financing exception, and reforms treatment of the foreign tax credit, for savings of $628 billion over FY2016–2025 (CTJ 2013). It curbs corporate deductions for stock options (saving $26 billion), limits the deductibility of bonus pay ($51 billion), eliminates corporate jet provisions ($3 billion), and reduces the level of deductibility of corporate meals and entertainment ($70 billion) over FY2016–2025. It saves $110 billion over FY2016–2025 by eliminating fossil fuel preferences through enactment of the End Polluter Welfare Act (EPWA) sponsored by Sen. Bernard Sanders (I-Vt.) and Rep. Keith Ellison (D-Minn.). The budget also ends tax deductions for the direct advertising of certain unhealthy foods to children ($15 billion over FY2016–2025). Besides increasing progressivity in the individual and corporate income tax codes, the People’s Budget reflects the belief that government should levy Pigovian taxes so that the consumption of certain goods reflects their true societal costs. The People’s Budget imposes a financial transactions tax (FTT) in order to raise significant revenue while dampening speculative trading and encouraging more productive investment. By adhering to the same tax base and rates as the FTT proposed in the Back to Work budget (the CPC’s FY2014 budget alternative), the FTT in the People’s Budget would raise $921 billion over FY2016–2025 (Fieldhouse and Thiess 2013). The budget would also enact an idea proposed by former House Ways and Means Committee Chairman Dave Camp (R-Mich.) by imposing a 0.35 percent tax on “systemically important financial institutions,” assessed quarterly, to address the issue of “too big to fail” ($112 billion raised over FY2016–2025) (JCT 2014). To reduce the emission of greenhouse gases and yield significant revenue on an annual basis, the budget would price carbon emissions starting at $25 per metric ton in 2016 and indexed at a 5.6 percent annual rate. Because pricing carbon has the potential to be regressive, the People’s Budget, like the Better Off Budget before it, would rebate 25 percent of the revenue from carbon abatement as refundable credits to low- and middle-income households. Net of this rebate, carbon pricing would raise $1.2 trillion in revenue over FY2016–2025. On a much smaller scale, the People’s Budget increases the federal excise tax on cigarettes by $0.50 per pack, raising $38 billion over FY2016–2025. Finally, the budget restores the progressive taxation of inherited wealth by instituting a progressive estate tax ($178 billion over FY2016–2025). It enacts Sen. Sanders’s Responsible Estate Tax Act of 2010, which sets an exemption level of $3.5 million and a graduated rate that rises to 55 percent for estates valued at over $50 million. The bill would levy a 10 percent surtax on estates valued at over $500 million. In total, the People’s Budget raises $6.9 trillion in additional revenue relative to current law (see Summary Table 3). Revenue levels in the budget average 21.2 percent of GDP over FY2016–2025 (see Summary Table 2). To eliminate the slack in the labor market—a precondition for real wage growth—the People’s Budget would finance enough in job creation measures and public investments to roughly close the projected jobs gap in calendar years 2015–2017. The U.S. economy would experience a sustained return to full employment under the People’s Budget. If the full amount of increased outlays and other job creation measures in the People’s Budget were passed and implemented in calendar year 2015, we project that on net GDP would grow by an additional $708 billion (3.9 percent) and nonfarm payroll employment would rise by 4.7 million jobs relative to CBO’s current law baseline at the budget’s peak level of effectiveness (roughly within one year of implementation). Given that calendar year 2015 is nearly a quarter gone, and given as well that some spending might create jobs only after an additional lag, the job creation numbers for 2015 might come in below these projections, but this means that our estimates for 2016 would rise as activity and job creation spilled over into that year. Our baseline forecast for 2015 without additional lag considerations is 2.7 million jobs created by the People’s Budget by the end of the year. In this analysis, we ignore these issues of potential lags and assume that the economic impact of the People’s Budget’s changes in outlays and revenues are reflected in the calendar year that these budget changes are made. Again, the only real concern this raises is that some of the impacts will be pushed from the end of 2015 and into early 2016. Either way, the People’s Budget will both solidify and accelerate an economic recovery that at the moment is coming too slowly, and that too many policymakers are assuming to be inevitable and imminent. The author would like to thank colleagues Josh Bivens and Christian Dorsey for their help with this project. Special thanks are due to Joshua Smith, Andrew Fieldhouse, and Rebecca Thiess, authors of previous EPI Policy Center analyses of CPC budget alternatives, for their assistance and guidance. Thanks also to CPC staff, especially Kelsey Mishkin. Thank you finally to Mike McCarthy for his helpful suggestions and excellent copyediting. All errors or omissions are solely the responsibility of the author. Thomas Hungerford joined the Economic Policy Institute as a senior economist in 2013. Prior to joining EPI, Hungerford worked at the General Accounting Office, the Office of Management and Budget, the Social Security Administration, and the Congressional Research Service. He has published research articles in journals such as theReview of Economics and Statistics, Journal of International Economics, Journal of Human Resources, Journal of Urban Economics, Review of Income and Wealth, Journal of Policy Analysis and Management, Challenge, and Tax Notes. He has taught economics at Wayne State University, American University, and Johns Hopkins University. He earned his Ph.D. in economics from the University of Michigan. Note: For the president’s budget, this figure uses CBO’s projections of GDP. Data for 2014 represent actual spending. * Historical average reflects the average nondefense discretionary budget authority as a share of GDP between FY1980 and FY2007 (the last year before the onset of the Great Recession). 12,780 13,786 14,506 14,825 15,085 15,425 15,800 16,188 16,668 17,121 17,523 18,008 n.a. n.a. 74.1% 76.5% 77.0% 75.2% 73.4% 72.1% 70.8% 69.6% 68.7% 67.7% 66.5% 65.6% n.a. n.a. 0 421 609 397 103 -229 -608 -1,038 -1,511 -2,017 -2,566 -3,174 n.a. n.a. 0 2.33% 3.23% 2.01% 0.50% -1.07% -2.73% -4.46% -6.23% -7.98% -9.74% -11.56% n.a. n.a. 74.08% 76.52% 77.06% 75.34% 73.53% 72.27% 71.06% 69.85% 69.03% 68.07% 66.90% 66.04% n.a. n.a. 74.08% 74.19% 73.79% 73.23% 72.88% 73.14% 73.53% 74.02% 74.93% 75.68% 76.23% 77.15% n.a. n.a. The Economic Policy Institute Policy Center has scored the policies proposed by the People’s Budget and modeled their cumulative impact relative to CBO’s March 2015 baseline (CBO 2015). Table 1 stacks the major policy alterations to the March 2015 baseline and broadly separates policy proposals into two categories: revenue policies and spending policies. All policies are depicted as the net impact on the primary budget deficit (excluding net interest) rather than the impact on receipts and outlays. Note that many revenue policies in Table 1 include related outlay effects (i.e., refundable portions of tax credits), and some policies in the spending adjustments include revenue effects. Spending changes in Table 1 reflect outlays rather than budget authority. Debt service is calculated from the net fiscal impulse to the primary budget deficit, and the unified budget deficit is adjusted accordingly.20 The net impact of these policy changes on the budget, as well as relative to CBO’s current law baseline, can be found in Summary Tables S1 to S4. In some instances it is necessary to extrapolate from existing official or trusted scores (e.g., those from the Congressional Budget Office, Citizens for Tax Justice, Joint Committee on Taxation, and Office of Management and Budget) to adjust from a previous budget window to the current budget window. In these instances, the out-year scores are adjusted as a rolling average of the change in revenue or outlays for the last three years of an official score. Where available, revenue and outlay effects, as well as on- and off-budget effects, are extrapolated separately. All policy changes affecting Social Security are modeled as off-budget revenue and outlay effects and are reflected in the summary tables as such. Unless otherwise specified, all tax policies are assumed to be implemented on January 1, 2016. Tax policies modeled from scores starting before FY2015 assume 75 percent of the revenue score for that year (the three quarters of FY2015 in calendar year 2015). More broadly, fiscal year scores are calculated as 25/75 weighted average calendar year scores where necessary. All economic impacts are estimated relative to CBO’s current law baseline. A fiscal multiplier of 1.4 has been assigned to government spending provisions, and a fiscal multiplier of 0.5 has been assigned to tax provisions. Moody’s Analytics Chief Economist Mark Zandi’s most recent publicly available estimate of the government spending multiplier is 1.4 (Zandi 2011), and this is robust to estimates by the International Monetary Fund, CBO, and the Council of Economic Advisers, among other forecasters (Bivens 2012b; CBO 2012b; CEA 2011; IMF 2012). Best estimates for tax provisions’ multipliers demonstrate greater variance, depending on how they are targeted to households or businesses more or less likely to spend an extra dollar of disposable income. Multiplier estimates of increased taxes on upper-income households (following Obama policy) and corporations are lower, at 0.25 and 0.32, respectively, and almost all of the People’s Budget’s revenue policies fall into one of these two categories. The multiplier for pricing carbon would be somewhat higher, even taking into consideration the refundable rebate, and 0.5 is assigned as a conservative estimate for all tax changes. Policy adjustments for 2015 are calculated as 100 percent of FY2015 and 25 percent of FY2016 budgetary costs. All current policy adjustments for calendar year 2015 adopt a 75/25 fiscal year/calendar year split. Following the methodology in Bivens and Fieldhouse (2012), a multiplier of 1.4 is assigned to removing sequestration. 1. Where policies in the People’s Budget have been carried over from previous CPC budgets, this paper draws accordingly from The ‘Better Off Budget’ (Smith 2014b), The People’s Budget: A Technical Analysis (Fieldhouse 2011), The Budget for All: A Technical Report on the Congressional Progressive Caucus Budget for Fiscal Year 2013 (Fieldhouse and Thiess 2012), and The Back to Work Budget: Analysis of the Congressional Progressive Caucus Budget for Fiscal Year 2014 (Fieldhouse and Thiess 2013), EPIPC’s analyses of CPC’s fiscal 2012, 2013, 2014, and 2015 budget alternatives. 2. These estimates are measured relative to CBO’s current law baseline. In our estimates the peak macroeconomic effect occurs at the end of 2015. Given that nearly a quarter of 2015 has already gone by and given various lags in enacting policy, as well as lags in policy affecting the economy, it’s likely that this peak level of effectiveness could be reached in early 2016 instead. Regardless, if the job creation measures in the People’s Budget were passed in coming months, there would be substantial near-term improvement in economic activity and jobs. 3. These estimates are measured relative to CBO’s current law baseline. This includes job creation measures, nondefense discretionary spending increases, and repeal of Budget Control Act discretionary spending caps (see Table 2). 4. The People’s Budget apportions increases to the nondefense discretionary budget functions as follows: 10 percent for International Affairs (Function 150); 5 percent for General Science, Space, and Technology (F250); 10 percent for Energy (F270); 5 percent for Natural Resources and Environment (F300); 5 percent for Commerce and Housing Credit (F370); 5 percent for Community and Regional Development (F450); 15 percent for Education, Training, Employment, and Social Services (F500); 10 percent for Health (F550); 20 percent for Income Security (F600); 10 percent for Veterans Benefits and Services (F700); and 5 percent for Administration of Justice (F750). 5. This includes both the jobs lost and the jobs that should have been created during this time to absorb new labor market entrants, which requires roughly 100,000 jobs per month. 6. This includes undoing nondefense discretionary spending cuts included in the Budget Control Act. 7. The Emergency Jobs to Restore the American Dream Act of 2011 was included in the Budget for All, the Congressional Progressive Caucus’s FY2013 budget alternative. The jobs creation package invests $113.5 billion in each of two years, and was estimated by Rep. Schakowsky’s staff to support the creation of 2 million jobs (Fieldhouse and Thiess 2012). 8. Emergency unemployment benefits have a relatively large economic impact per dollar. Mark Zandi of Moody’s Analytics has estimated this policy to have an estimated $1.52 impact per dollar spent (Zandi 2011). 9. The initial benefit would be one-and-a-half times that of the expired Making Work Pay tax credit, bringing the maximum benefit to $600 for an individual and $1,200 for joint filers for the first two years, before reverting to the original level during the third year. During these first two years, the phase-out rate would be increased to keep the cost of the expanded tax credit at twice the budgetary cost of the lapsed credit. 10. The $342 billion is the additional NDD outlays that result from repealing both the BCA NDD caps and the BCA NDD sequester over FY2015–2024. 11. Similar to the Better Off Budget, NDD budget authority is increased by $75 billion for the remainder of FY2015, $150 billion for FY2016, $200 billion for FY2017, and sustained for the rest of the budget window. The associated budgetary outlays can be seen in Table 2. 12. This includes undoing both phases of NDD cuts in the BCA. 13. The People’s Budget would reclassify surface transportation outlays (currently discretionary spending) as mandatory, but this policy change has been excluded from NDD outlays in Figure C for an apples-to-apples comparison with historical and projected spending levels. 14. These AGI cutoffs are measured in 2009 dollars and were subsequently indexed to inflation in the administration’s budget requests. 15. These rates were scheduled to revert to 28, 31, 36, and 39.6 percent. ATRA levied a 39.6 percent rate only on income over $400,000 ($450,000 for married couples). 16. The taxable income thresholds for these rates are applicable to individual, head of household, and married filing jointly tax returns by filing status. The taxable income thresholds for these rates are halved for married couples filing separately. 17. The collective budgetary impact of these policy modifications to the individual income tax were scored by Citizens for Tax Justice using the Institute on Taxation and Economic Policy (ITEP) microsimulation model, which is similar to models used by official scorekeepers at the Treasury Department and the Joint Committee on Taxation. The score of taxing capital gains as ordinary income takes into account behavioral responses of capital gains realizations to higher tax rates. 18. These calendar year increases are based on additional outlays of $407 billion in FY2015, $483 billion in FY2016, $368 billion in FY2017, and $310 billion in FY2018, relative to CBO’s current law baseline (see Table 2). 19. These calendar year increases are based on net decreases in revenue of $300 billion in FY2015, $548 billion in FY2016, and $615 billion in FY2017 relative to CBO’s current law baseline (see Summary Table 3). 20. Debt service is calculated by the CBO’s debt service matrix for the March 2015 baseline. Fieldhouse, Andrew, and Rebecca Thiess. 2012. 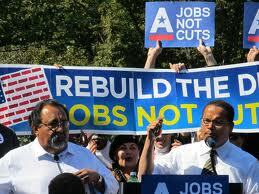 The Budget for All: A Technical Report on the Congressional Progressive Caucus Budget for Fiscal Year 2013. Economic Policy Institute Policy Center, March 28.